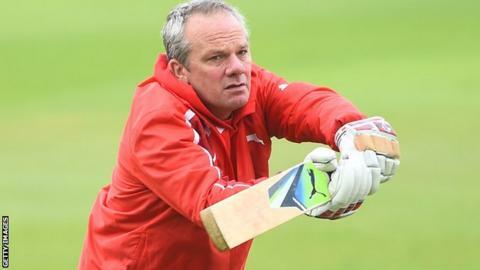 Nottinghamshire director of cricket Mick Newell says Friday's T20 Blast North Group game at Leicestershire is so important for the cricket club. The Outlaws, who have been beaten in the T20 quarter-finals in the last four years, go into the game in fifth place. Notts need to beat the Foxes and hope either Lancashire or Northants slip up in their final games on Friday. "Friday night is a massive game for the club and the team," Newell told BBC Radio Nottingham. "We want to win that match and put some pressure on other teams - and make them win their games." T20 captain James Taylor and bowler Harry Gurney are set to face their former club, while batsman Greg Smith, who made the move across the East Midlands in the winter, may also feature. Gurney took 23 wickets for the Foxes when they won the Twenty20 in 2011, while Taylor scored a century on his Championship debut for Leicestershire against Middlesex back in 2009. "It's a special place for myself, Titch (James Taylor) and Greg (Smith)," said Gurney. "It's always nice to go back there, if slightly weird. "After losing the fixture to them at home, from a Nottinghamshire perspective we do need to get down there and put one over on them. "We will go to Grace Road and priority number one is to get the two points and if we don't do that, we won't qualify. "We just need the points and then hope one or two results around the country go our way." Nottinghamshire's game at Grace Road gets under way at 17:30 BST, as does Lancashire's trip to already-qualified Worcestershire, while Northants against Durham begins an hour later.